I remember my dad telling me when I was a kid that Amarone was one of the world’s great wines. Just behind Barolo, in his view. Ever since then, these wines have been a source of endless fascination. In the mid and late 1990s, when Italy’s top restaurants still kept well-stocked cellars of older wines, it was possible to find aged Amarone for extremely reasonable prices, making it quite fun and relatively easy to learn about the wines. Sadly, those days are long gone. Still, Amarone remains one of my favorite Italian wines. Like many consumers, I sometimes have a hard time finding the right occasion to open a bottle. When I do, I always wonder why I don’t drink Amarone more often. As delicious as Amarone can be when young, the best wines also age exceptionally well. This vertical was fascinating for many reasons. The ability to chart the development of an estate is of course highly educational, but following the arc of these wines over several decades was more than once a truly emotional experience. Zenato is one of Veneto's most storied family-run estates. Sergio Zenato founded the winery in 1960. The first Amarone followed a few years later, in 1967. Sadly, Zenato passed away in 2008. Today Zenato's children Alberto and Nadia are doing terrific work across the entire range of wines. 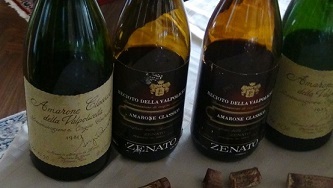 Zenato makes two Amarones, a Classico and a Riserva. Both Amarones are aged predominantly in cask. The Classico spends about three years in oak and also sees some French oak tonneaux, while the Riserva emerges from the estate’s older vineyards and spends four full years in Slavonian oak casks. One of the most fascinating aspects of a tasting such as this one is having the ability to follow the evolution of a wine over several decades, which is illuminating, to say the least. Over the years, the Zenato Amarones have become bigger and richer, with higher dry extracts, but there is also a distinct house signature that runs through all the wines. Zenato’s 2006 Amarone della Valpolicella Classico emerges from the glass with sweet dark red cherries, chocolate, flowers, spices and licorice. Today the 2006 comes across as powerful, structured and tight, but all it needs is time, as I witnessed firsthand over the time I followed it. Drinking window: 2015-2026. The 2006 Amarone della Valpolicella Classico Riserva Sergio Zenato wraps around the palate with layers of mocha, espresso, Morello cherries, spices, mint and new leather. It is a wonderfully plush, expressive wine loaded with aromatic and flavor complexity. There is plenty of inner perfume and sweetness, but what impresses most is the wine’s sense of structure and length. Darker notes flesh out on the finish adding a baritone register to the fruit that is highly appealing. This is a fabulous showing from Zenato. Drinking window: 2016-2026. A pretty, nuanced wine, the 2005 Amarone della Valpolicella Classico is all about detail. Crushed flowers meld into licorice, new leather, licorice, cinnamon and dark berries. The 2005 is layered and finely sculpted all the way through to the finish. Early appeal is the signature of this vintage. Drinking window: 2013-2020. The 2005 Amarone della Valpolicella Classico Riserva Sergio Zenato is an attractive, juicy wine that reveals most of its seductive charm in a fairly immediate style. It boasts lovely mid-palate intensity to go along with the suave tannins. Crushed flowers, truffles, tobacco, sweet red fruit and spices are some of the nuances that take shape in the glass. The power and sheer structure of the very best years is missing, but in exchange readers will find a supple, expressive Amarone that is ready to deliver plenty of pleasure today. Drinking window: 2013-2023. The 2004 Amarone della Valpolicella Classico Riserva Sergio Zenato wraps around the palate with plums, dried cherries, spices, mint and leather. Layers of fruit blossom beautifully on the palate as the wine shows off its fleshiness and depth. Signs of early tertiary complexity, especially in the bouquet, add lovely nuance. The 2004 is developing a little faster than I originally envisioned and isn’t likely to be a super long-term ager. Still, it is undoubtedly beautiful, harmonious and understated in its intensity. Drinking window: 2013-2019. What a pleasure it is to taste the 2003 Amarone della Valpolicella Classico Riserva Sergio Zenato, one of the most pleasant surprises in this tasting. Black cherries, mint, leather and licorice are some of the many notes that flow from this explosive, totally expressive Amarone. The 2003 boasts notable richness, power and full-throttle opulence. Readers will recall that 2003 was a blisteringly hot year in Italy, hardly the conditions that are ideal for Amarone. Yes, the 2003 has a lot of richness and overtness, yet Zenato has somehow managed to balance those elements beautifully here. Ideally, the 2003 needs another few years for some of the baby fat to melt away. There is a lot to admire here. Drinking window: 2015-2023. The 2001 Amarone della Valpolicella Classico Riserva Sergio Zenato is gorgeous. Cedar, leather, exotic spices, brown sugar and plums are some of the many notes that are woven together in this silky, supple Amarone. Fine tannins frame the fruit through to a finish laced with exotic, highly expressive aromatics. The 2001 is drinking beautifully and will continue to deliver considerable pleasure over the next decade or so. Drinking window: 2013-2021. Zenato’s 2000 Amarone della Valpolicella Classico Riserva Sergio Zenato continues to develop beautifully in bottle. There is plenty of freshness, clarity and nuance in the fruit as the wine has begun to move into its second decade. Vibrant mineral notes underpin the articulate finish. The 2000 isn’t a huge version Riserva, but it is among the most refined. Hints of chocolate, mocha, graphite and black cherries wrap around the persistent finish. This is the first vintage in which the estate started using slightly smaller barrels in addition to casks. This is a superb effort from Zenato. Drinking window: 2013-2020. One of the highlights in this tasting, the 1998 Amarone della Valpolicella Classico Riserva Sergio Zenato saturates the palate with black cherries, plums, chocolate, spices, tobacco and new leather. There is an exotic quality to the 1998 that is particularly compelling. This is a gorgeous, totally complete Amarone from Zenato. Drinking window: 2013-2020. The 1997 Amarone della Valpolicella Classico is quite a bit more mature than the 1998 that precedes it in this tasting. The wine stands out most for its silky tannins and long, finessed finish. I don’t see the 1997 hanging on for too much longer considering that the aromas and flavors are already very much on the forward side, but there is no question the wine has aged beautifully. Drinking window: 2013-2017. The 1995 Amarone della Valpolicella Classico Riserva Sergio Zenato is another wine that has aged impeccably. A firm tannic spine provides the backbone for the gorgeous dark red fruit. This was a challenging harvest with usually warm spring temperatures and rain just before the harvest, yet the wine has turned out beautifully. Sweet herbs, plums, dark cherries, licorice and tobacco are layered into the pointed finish. I loved it. Objectively, the 1995 isn’t one of the all-time great wines at Zenato, as the estate hadn’t honed in on their house style to the degree they would a few years later, but this is still fabulous wine. The cool growing season resulted in long hang time, something that is almost always favorable for the long-term development of wines. Best of all the 1995 remains fresh, vibrant and full of life despite relatively low dry extract readings relative to the vintages that would follow. Drinking window: 2013-2020. Zenato’s 1993 Amarone della Valpolicella Classico Riserva Sergio Zenato is another wine that has developed beautifully in bottle. The aromas and flavors are tertiary, yet there is more than enough density and body for the wine to drink well for a number of years. Sweet tobacco, mint, dried flowers, herbs and cedar add considerable nuance and depth on the textured, generous finish. Drinking window: 2013-2018. The 1991 Amarone della Valpolicella Classico is a pretty, feminine wine. Stylistically, it opens the door in this vertical tasting to the wines of early 1990s and late 1980s that were made with higher yields and lower dry extracts than is the norm today. Dried herbs, crushed flowers, mint, cherries and leather are some of the notes that emerge over time. There is a lot to like in the 1991 Riserva, but the wine is now fully mature and needs to be drunk. Drinking window: 2013-2013. A highly representative example of the year, the 1990 Amarone della Valpolicella Classico Riserva Sergio Zenato wraps around the palate with generous fruit. Prunes, Christmas spices, dried flowers and mint add complexity to the fruit on the enveloping, caressing finish. The 1990 has just a bit more depth and textual volume than the 1991, but it, too, appears to be best suited for drinking over the next few years. Drinking window: 2013-2016. Another of the highlights in this vertical tasting, the 1988 Amarone della Valpolicella Classico Riserva Sergio Zenato impresses for its freshness and vibrancy. The aromatics and flavors are naturally quite advanced, but there is a backbone of acidity that keeps the wine fresh, expressive and vibrant. It’s fascinating to watch the wine turn explosive with time in the glass. Fresh, vibrant and pedigreed, the 1988 still has the stuffing to drink well for at least a few more years, it not more. This is one of my very favorite vintages. Interestingly, the 1988 includes a dollop of Sangiovese. Drinking window: 2013-2018. By the standards of its era, the 1986 Amarone della Valpolicella Classico Riserva Sergio Zenato is a big, big wine even though the residual sugar and dry extract numbers are actually lower or in line with those of the wines produced during the 1980s. Hints of Smoke, licorice, tobacco and smoke emerge in the glass, adding complexity and nuance. A striking finish bristling with pure energy rounds things out nicely. Drinking window: 2013-2018. The 1985 Amarone della Valpolicella Classico Riserva Sergio Zenato shows the generosity and richness of the year in its expressive fruit and broad-shouldered personality. Hints of tobacco, cedar, sweet herbs and licorice add layers of complexity and dimension to the fruit. There is a wonderful immediacy to the 1985, but it won’t drink this well forever. I would prefer to finish any remaining bottles within the next 2-3 years. Drinking window: 2013-2015. The product a cold year, the 1983 Amarone Classico has aged beautifully. Dried cherries, tobacco and licorice waft from the glass. The 1983 Riserva is now fully mature, even if some elements of tension from the cool vintage are present, especially on the finish. I don’t see much likelihood of further development at this point. The 1983 is a touch compact and clamped down on the finish, but not enough to materially detract from what is otherwise an absolutely delicious wine. Drinking window: 2013. The 1981 Amarone Classico is flat-out beautiful. At 30+ years of age it boasts tremendous richness and depth, especially for a wine of its era. Chocolate, Earl Grey tea, dried cherries, crushed flowers and cedar are some of the notes that add a measure of nuance to this powerful, muscular Amarone. The growing season was marked by warm summertime temperatures that led to an early harvest. Today, the 1981 is an eloquent reminder of just how well Amarone can age. Drinking window: 2013-2015. The estate’s 1980 Amarone Riserva has held up beautifully. The 1980 isn’t Zenato’s most refined wine by any means, but it has developed into a gorgeous, complex Amarone with tons of personality, no doubt helped by the bright, vibrant acidity that underpins the mid-palate and finish. Some slightly rustic elements remain, but not enough to detract from the wine’s overall pleasure. This is a terrific showing for the era. Drinking window: 2013.